Sam Houston State University criminal justice professors Rolando del Carmen (left) and James Marquart will receive awards from the Academy of Criminal Justice Sciences next month in Chicago. It is the first time that two individuals from one university have been recognized by the Academy in the same year. Two Sam Houston State University criminal justice professors will be honored next month for their extraordinary accomplishments by one of the most respected organizations in the field of criminal justice. James Marquart and Rolando del Carmen will be recognized in Chicago on March 19 by the Academy of Criminal Justice Sciences, an international association that promotes criminal justice education, research, and policy analysis within the discipline of criminal justice for both educators and practitioners. This is the first time in the Academy's 40-year history that two individuals from one university have been recognized in the same year. "To have two professors from one university recognized by this organization for such prestigious honors is a remarkable accomplishment and reflects wonderfully on our program at Sam Houston State University," said Janet Mullings, assistant dean of criminal justice. "We are very fortunate to have individuals in our program like Dr. Marquart and Dr. del Carmen, who are recognized nationally and internationally, for their contributions to the criminal justice discipline," she said. "Both are extraordinarily talented scholars who are among the top in the field with productivity and quality of work," she added. Marquart will receive the 2005 Bruce Smith Sr. Award, the association's highest honor. To be selected, a recipient must demonstrate leadership in the administration of criminal justice as an academic or professional discipline in a manner which reflects the highest standards of integrity and performance. The recipient must also display active involvement in criminal justice research or an endeavor which has made substantial contributions to the development of emerging information in criminal justice. Marquart has been at Sam Houston State University since 1986, and currently serves as director of research for the College of Criminal Justice. In addition to his duties as professor of criminal justice, he has served as director of the Crime Victims' Institute and director of the National Institute for Victim Studies. He has been involved with a number of funded research projects on topics such as factors determining recidivism in the Texas Youth Council, AIDS-risk behavior of mentally impaired women prisoners, prison gang structure, prisoner classification systems, and the use of in-house training videos for correctional officers. He recently co-edited a book on the victimization of children, and has co-authored books on a number of issues in corrections. In 1995, he was named the winner of the American Library Association, Association of College and Research Libraries' Outstanding Book Award for "The Rope, the Chair, and the Needle: Capital Punishment in Texas, 1923-1990." 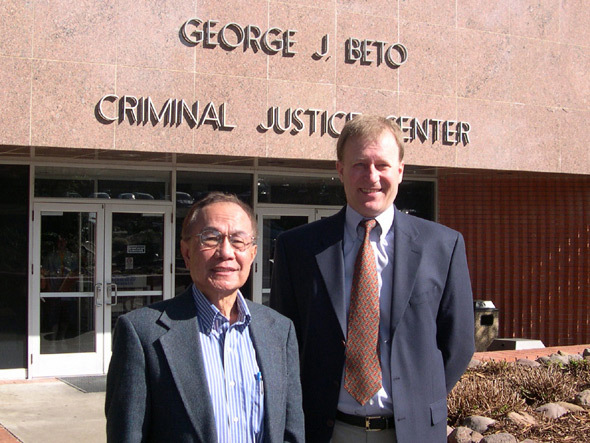 He was also the winner of the Academy of Criminal Justice Sciences' 1991 Outstanding Book Award for "An Appeal to Justice: Litigated Reform of Texas Prisons." He has written numerous chapters and articles in other books and publications on inappropriate relationships between inmates and correctional staff, inmate racial integration, health concerns of older prisoners, and other topics specific to the prison environment. In 1997, he was awarded the Leverhulme Visiting Professorship at Queen Mary and Westfield College (University of London) Faculty of Laws in London, England. He taught classes and conducted research there comparing high security prisons and jails in Great Britain and the United States. Del Carmen, who was named Distinguished Professor of Criminal Justice in 1995, will receive the Academy Founder's Award. With this award, del Carmen becomes the only individual in the Academy's history to receive all three of the association's honors. In 1990 he received the Academy Fellow Award, and in 1997 he received the Bruce Smith Sr. Award. The Academy Founder's Award is designed to recognize someone who has been an active member of the Academy for at least five consecutive years and who during that time has also demonstrated active involvement in criminal justice education and research. In addition, the award is intended to recognize substantial contributions to the Academy and to the discipline of criminal justice through the winner's participation in various service activities. Del Carmen came to Sam Houston State University in 1974, and is considered by many to be one of the nation's leading experts on criminal justice law. He teaches classes on the legal aspects of corrections and law enforcement, evidence, law and society, legal liabilities of public officers, and criminal procedure. He is an active member of numerous criminal justice associations and societies and is the founder of the Law, Courts and Human Rights Section of the Academy of Criminal Justice Sciences. Del Carmen has authored and edited numerous books on civil liabilities and rights of police officers and probation and parole officers, community-based corrections, and Texas juvenile law and practice. He has also written book chapters and sections on police civil liability and the law, constitutional issues arising from the "Three Strikes" legislation, legal issues in drug testing offenders and criminal justice employees, and the use of force in policing. In 2000, del Carmen was awarded a $15,000 grant from the National Institute of Corrections to revise the book "Potential Liabilities of Probation and Parole Officers." He has also received a number of other grants to conduct research on national drug testing standards; the liabilities of parole boards for release, suspension and revocation of parolees; legal issues in the use of electronic surveillance in probation; and the "Chicano Offender" for the training manual of the National Academy of Corrections. In 1998, he was selected as one of 10 awardees from among 99 nominees from various colleges and universities in Texas to receive the Piper Foundation Award. He also received an award from the Texas Governor's Office for membership and work in the Legislative Committee of the Governor's Juvenile Justice and Delinquency Prevention Advisory Board. This body, composed of 12 members, held a series of meetings in Austin over several months to suggest revisions to the current juvenile laws of Texas to make them conform to Federal laws. Other members of the Sam Houston State University criminal justice program who have been recognized by the Academy of Criminal Justice Sciences are Richard Ward, dean of the College of Criminal Justice, and Larry Hoover, professor of criminal justice and director of the Police Research Center. Ward was presented the Founders Award in 1985, and Hoover received the award in 2003.